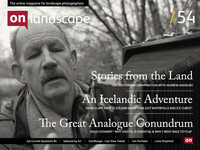 Last issue we made a quick preview of the CamRanger device which I have to say I was quite enamoured of. We mentioned at the time that the CamRanger was showing differing resolutions in live view for the Nikon and Canon cameras and we promised we'd do a further test to show more details about this. So here we are - we spent a bit of time shooting video of the CamRanger in action on a retina iPad at Brimham Rocks. We also gave the focus stacking option a little bit of a try out.